It’s March madness time and there's no better way to get in the spirit of the sport than to put in—or upgrade—a basketball hoop. There are too many options available to look through them all. Don't try, you’ll hurt yourself! We’ve gone ahead and done some compiling for you of the best basketball backboard to fit your hoop. 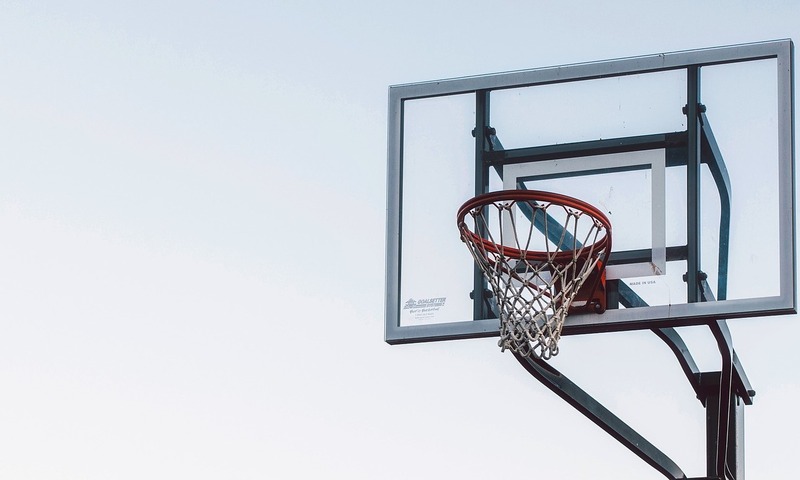 If you don't have a backboard and hoop already, you'll need to decide on some specific features, which can differ depending on how you wish to use it. If you already the complete basketball system of a basketball hoop, net, backboard, pole and everything else consider an upgrade. The size of your backboard will directly correlate to the size of your rim and your available space. Also, there are some elements of consideration which concern the intended use of the unit. If your basketball hoop is only meant for use at home, maybe for the kids, you will want to look for different sizing features than that of a hoop used for off-season college training for students or other professional related uses. The backboard size will generally fall between 46 inches wide, to 72 inches wide. Be careful choosing too small of a backboard size, as it will become difficult to bank shots off of for most adult players. The game of basketball has evolved substantially since its meager induction into the sporting world. In the 19th century, basketball was invented by mounting a peach basket on a board or wall. The principle was generally the same—putting a ball through the basket to score a point. The progression of the game was fueled by its official approval as a sport in 1909. The design of backboards began to gradually change through the years, from a wall to a wire-mesh board, then to wood, and finally to transparent glass, which the game still uses today for regulation basketball. Since the game's official acceptance in 1909, many rules and regulations were added, including specific dimensional regulations that concern the baskets backboards. and the backboard must measure to a width of six feet exactly. Collegiate basketball regulations differ from that of professional ball when it comes to the required height of the board. In the NBA and WNBA, the basketball backboard must measure to the height of three and a half feet tall and no more. The National Collegiate Athletic Association allows the court’s backboards to measure between three and a half feet to four feet tall. However, most collegiate basketball courts are made to professional specifications, as too are high school courts. High school athletics has very strict regulations and conforms to all NCAA standards. In deciding the correct-sized backboard for your home, office, or school court the most important factor in one's decision making will likely fall to the size of one's intended area for playing. Professional basketball uses a 72-inch wide backboard, which measures at 6 feet. If your space will accommodate a board of that size, go for it. If the space you are setting it up in does not have the area to accommodate a full-sized, six-foot backboard, try to find a backboard that is as close to 72 inches as you possibly can. The concern in getting a backboard that is a deviation from a full-sized regulation b﻿ac﻿kboard is more so for those who are playing on a team or for any sort of competitive organization. If you spend all your practice time doing layups on a backboard that measures less than 72 inches, your shot will take a bit of a learning curve when you acclimate to a regulation sized board. Unfortunately, this would often happen when you need your best game in competition. The best backboard for you depends on what you are using it for and where it will be located. A full basketball court—or half court—will likely be served best by the industry standard quality equipment. This will allow the usage of one's equipment to benefit their game the most effectively and directly. One such basketball backboard is the Gared LXP4200 Steel Frame Glass Backboard (EA). 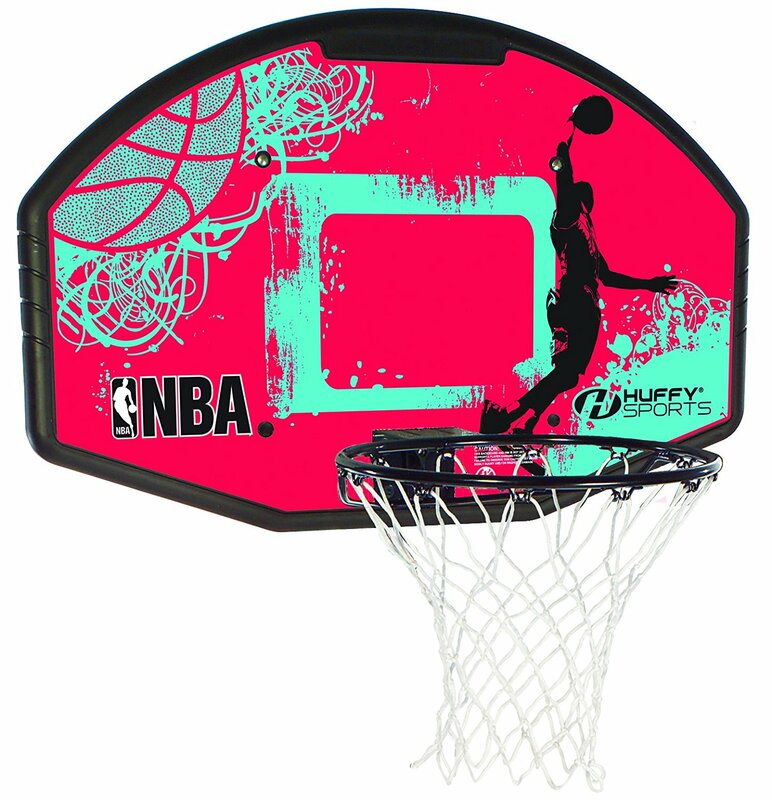 This backboard is branded by EA Sports, a world leader in the commercial sporting equipment industry. 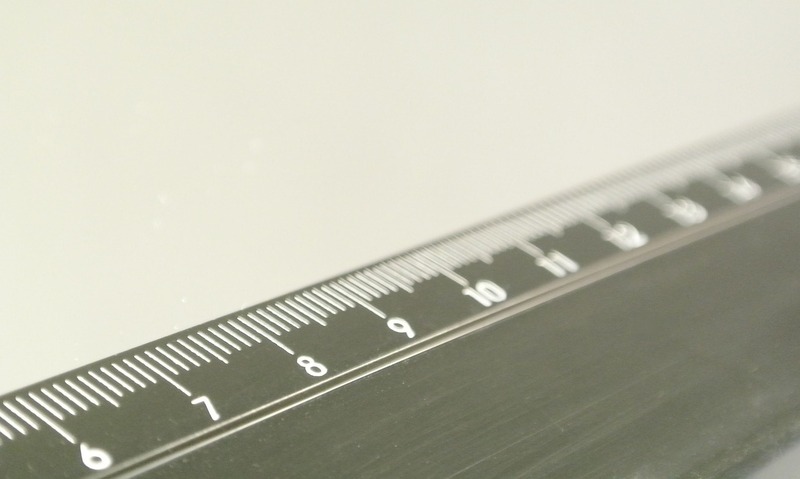 It measures 42 inches by 72 inches, from steel frame edge, to edge. The spacing conforms exactly to the NCAA and NBA regulations for tournament play. The unit weighs 201 pounds (without padding) and is made of a transparent glass. This is the best backboard for professionals, amateurs, and serious enthusiasts. It can be mounted on either outdoor courts or indoor basketball courts. For strictly indoor use, often at a lower cost, non-transparent backboards are used. These are more common in high school and public courts, where regulations are not mandatory. However, these boards are no downgrade to the glass backboards. 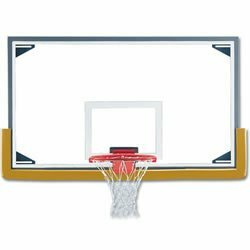 The 1460sb 42" x 72" Rectangular Fiberesin Basketball Backboard from Spalding, measures to regulation specifications and is made out of a synthetic backboard material. 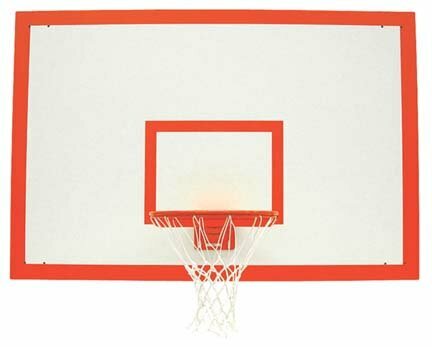 The Spalding 1460sb Rectangular Fiberesin Basketball Backboard comes with a 10-year warranty; however, that does not cover outdoor damage or nature accidents. This board is meant for indoor use. Other backboards are great for spaces with area restrictions or that are solely intended for shots, instead of on a full or half court. The Gared Steel Fan Shaped Front Mount Backboard is one such backboard, which might be perfect for the driveway, over the garage, or in the backyard barn court. The board is as small as you want to go, while still being able to use it for bank shots, at 54 inches by 35 inches. The fan shape is both classic and unique and is great for hobbyists and enthusiasts alike. For the young ones and for little ones, even a 54-inch wide backboard may prove to be unnecessary or just too large. Junior backboards are much more reasonable, especially for kids who just want to have fun throwing the basketball. The Spalding Eco Composite Combo with Mounting Bracket is a great basketball backboard for beginners. It only measures 44 inches wide, which will make for satisfying gameplay for kids.